35-Hour Hands-On Pro Mixology Training Experience. Looking to make some extra cash and have some fun working on your own time and your own terms. In 7 up-beat and informative, hands-on mixology training sessions, you can become a Certified Professional Bartender-Mixologist. Taught from ‘scratch’ just like you’ll use it on the job, there’s lot’s of practice and plenty of review, as you learn and experience everything you’ll need to succeed in the world of Professional Bartending. And most importantly, all of your drink-making techniques are up-to-date, all of your ProTender Cocktail Preparation Manuals are current, and all of your instructors are licensed hospitality professionals with plenty of knowledge to share with you. 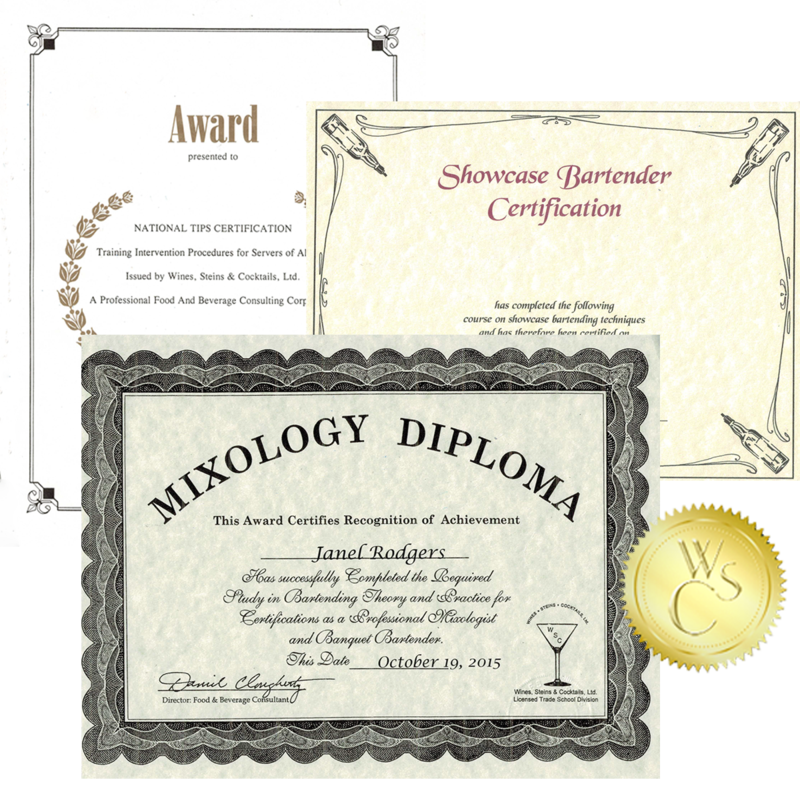 The Professional Bartender Certification Program meets any & all training and certification requirements to bartend professionally in all 50 states. Tuition includes all Books, Supplies, Instructional Fees, Certification Papers, National Job Referral I.D. Card and Letters of Recommendation. Check out our full course brochure for more information! Learn & Earn – Make up to $300 and more per shift.! Call us today at 1-800-333-7122, Contact Us online, or register and pay online below to sign up! I am making my registration of $75 to reserve my place in the Professional Bartender Certification Program. Thereafter, I agree to pay $60 at each of the 7 Hands-On Mixology Training Sessions. Don’t have a credit card? No problem. Select Check Payment at checkout and follow the instructions. Students who have made their registration fee may cancel their enrollment and receive a full refund provided that they cancel by certified mail within five (5) days after submitting their registration fee to reserve a place in the program and prior to the first day of class. If a student terminates his training after the beginning of the first day of class, the school shall retain the earned tuition on a prorata basis. The school shall provide refunds to students within 30 days. The school shall issue Certificates to all students who have successfully completed all requirements, and that includes payments of all fees. A fee of $35 will be assessed for all returned checks over and above the amount due.